Fall has arrived with the expected cooler temperatures along with some very long rainy days. When I am bundled up in the house looking out at the dreary grey skies and heavy rain, I love to cuddle on the couch with my pup under a warm throw blanket and read (or catch up on computer work). On days like that, there is nothing as comforting as the fragrance of a slow cooking stew wafting through the house, and I’ve find it so easy to create a great in a slow cooker or crockpot. I cannot believe that for so many years I never wanted a slow cooker and wasn’t even tempted to buy one until last year. Although I do occasionally oven roast a big roast, when it comes to such dishes as stews or chili, I find the slow cooker is the perfect kitchen appliance to use. I am slowly trying very hard to create meals from the items still in my freezer as we will be leaving Umbria in just 3 weeks and I need to use up all perishable items before we leave. I had a nice pork shoulder roast in the freezer that I decided to turn into stew last week. Although I kept my stew simple and included just onions, celery, and carrots, you could also include diced potatoes, bell peppers, or button mushrooms if you prefer. 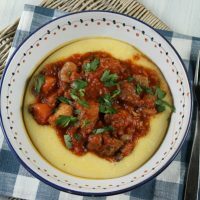 I love to serve stews like this one on top of a pillow of soft polenta as shown, but you could also serve the stew on rice, cooked pasta, or simply on its own in a bowl. 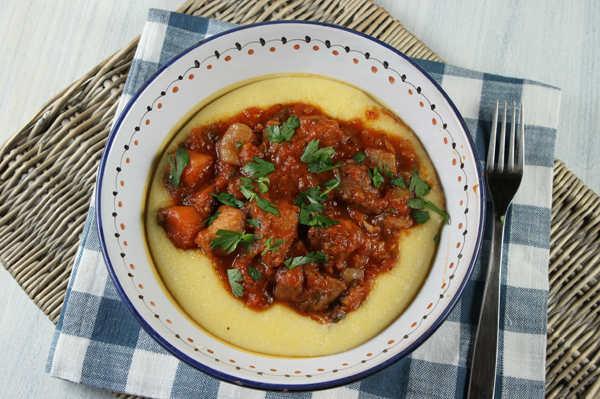 A hearty pork stew cooked for hours in the slow cooker until meltingly tender, is served on top of a bed of polenta. Trim the roast of fat, and cut into 1-inch pieces. 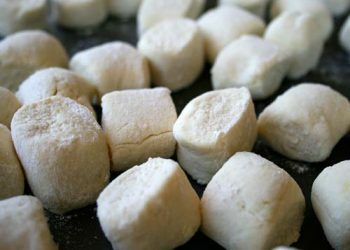 Place the flour in a plastic bag, dump in the pork pieces and shake the bag until coated. Heat half the oil in a heavy skillet, and cook half the pork pieces over medium heat until lightly browned. Place the browned pork pieces in the slow cooker, then continue to brown the remaining pieces, and place these in the slow cooker when browned as well. Dump the rest of the browned pork and remaining stew ingredients except the garnish into the slow cooker and turn it on low for 8 hours. Just before you are ready to serve the stew, heat the water in a pot with the salt until boiling. Pour the polenta into the boiling water, whisking continually until the polenta is smooth and thick. Turn the heat to a simmer, cover, and continue to cook for 20 to 30 minutes, stirring vigorously every 10 minutes until the polenta is soft. Remove from the heat and stir in the cheese and butter. 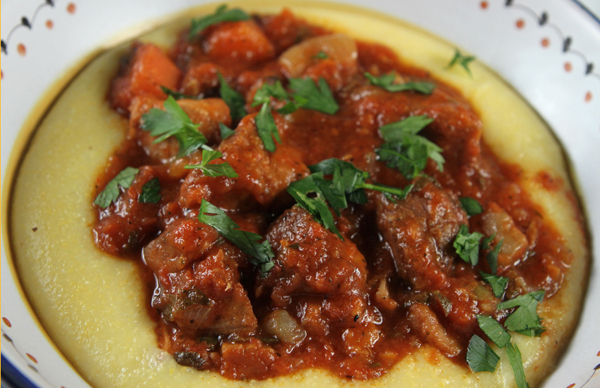 Scoop some polenta into four bowls, then spoon the stew on top, and garnish with the chopped parsley. 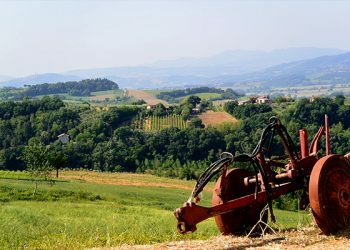 I love your website and recipes, and once my son finishes HS I would also love to live 6 movths Italy, 6 months US (now we ‘re in a small village in central Italy full-time). 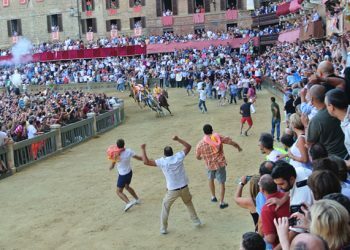 Do you know what this cut of meat would be called in Italian? After eight yeats here, I still have problems at the butcher as I fiind that meat is just cut differently! Any resource for handy meat-cuts translations? 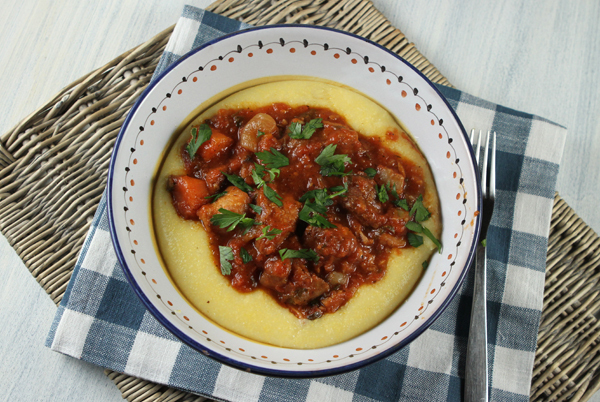 With Penelope still around and the temperatures dropping, it certainly is ‘polenta time’! We’ve been cooking with lots of polenta in Pisa too! This pork recipe looks amazing! 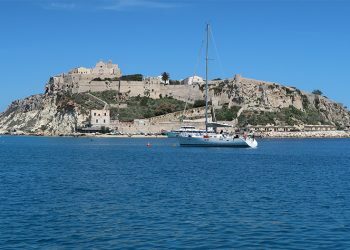 Will definitely give it a go! Thanks for giving me a reason to haul out the slow cooker I haven’t used for years. The stew looks lovely and I really like that you served it on polemta! I’ve never tried polenta. 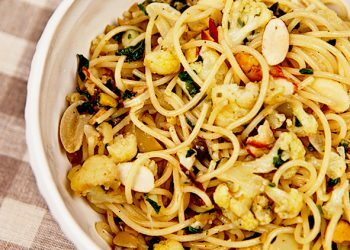 This looks delicious, can’t wait to try it! Made this recipe yesterday. It was delicious! 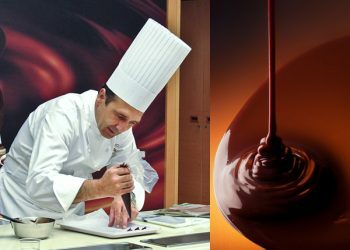 Hi, I love your sight, because I love cooking, and trying new, authentic, traditional, recipes, from other countries, cultures. I especially LOVE Italian food. I cook for my church once a month and I always want something different. 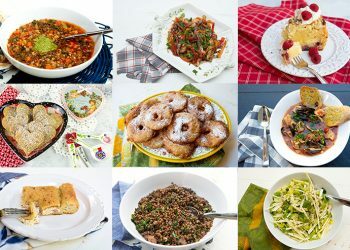 I want to try the Slow Cooker Pork Stew and Polenta this month (December) I usually use electric roasters, because the meal has to be prepared at home, and brought to church. Do you think it would work in a roaster cooked all day instead of slow cooker? Also how will Polenta hold up if cooked and then kept warm in roaster or crock pot? I usually feed about 40-60 people. Made this last night. It was delicious!! I will definitely repeat this recipe! Thanks! I live in the southern U.S. where grits are popular for breakfast. 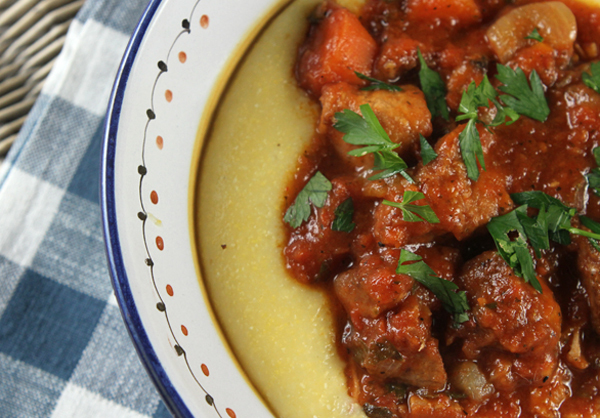 I guess polenta is essentially the same thing as grits, yes? I’ve had shrimp and grits before, but would not have thought of serving stew over grits! It looks beautiful when served too! This was so delicious. A definite keeper! Thank you for another wonderful recipe. I love your website! Salad, our meal was perfect. I love your website.